Stewart Garden is pleased to announce the launch of The Stewart Garden Schools Programme 2018. The competition rewards the creativity and achievements of schools’ gardening achievements and is open to schools all over the UK with students aged between six and eleven. Schools who wish to participate are invited to use a kit, provided by Stewart Garden, in a creative gardening project of their choice, and submit the results to judges. The winning school wins £1,000 in vouchers to spend at their local gardening centre to support them in their future projects. The three runner-up schools win vouchers for £100 each. 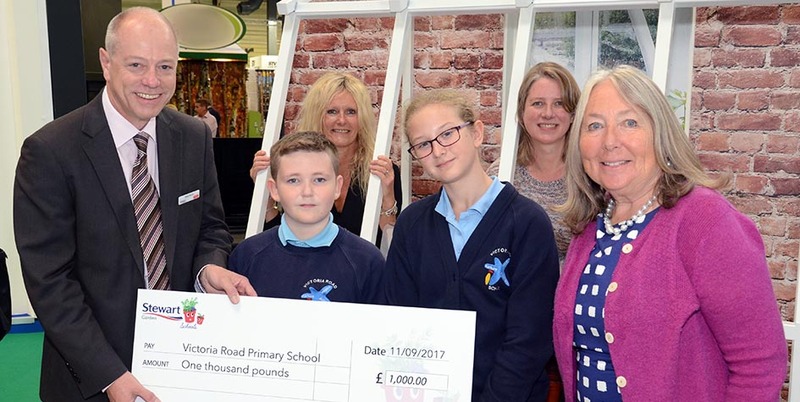 Stewart Garden recently announced the winners of the 2017 Stewart Garden Schools Programme, the students of Victoria Road Primary School, of Northwich in Cheshire. With the use of their kit, they created bright planters from old wellies and bottle gardens on fences. Cutcombe Church of England First School, in Somerset, were victorious in 2016 with a project which judges loved because of its overlap with their curriculum – it incorporated elements of science experiments and showed a real enthusiasm for gardening on the part of the young people. The Stewart Garden Schools Programme recognises that it is now more important than ever that children learn how to grow their own fruit and vegetables and aim to encourage this through the competition. Schools who apply to take part will receive a kit to get them started. Last year this included flower pots, a scoop, watering cans, seed trays, an unheated propagator and a booklet of information to help them. This kit will be sent to the person identified as the point of contact at each school. To enter, schools should apply now by emailing pr@redheadpr.co.uk. The closing date for entries to the 2018 Stewart Garden Schools Programme is the end of December 2017.